There are several methods of classification of circuit breakers. The most general way of the rating of a circuit breaker is by the arc extinction medium. The arc extinction can easily be done by using the different medium like air, insulator, gas, vacuum, dielectric, etc. By the arc extinction medium, the circuit breaker is categorised into four types. They are the air break circuit breaker, air blast circuit breaker, sulphur hexafluoride circuit breaker and vacuum circuit breaker. The classification of the circuit breaker is shown in the figure below. The circuit breaker is mainly categorised into two types. They are the AC circuit breakers and the DC circuit breakers. The AC circuit breaker is sub-classified into two types, i.e., the low voltage circuit breaker and the high voltage circuit breaker. The circuit breaker whose value lies below the 1000V is known as the low voltage circuit breaker, and above 1000V it is known as a high voltage circuit breaker. The high voltage circuit breaker is further classified into two main categories; they are the oil circuit breakers and the oil-less circuit breaker. The oil circuit breaker uses oil for an arc extinction. It is further sub-categorized into bulk oil type and the minimum oil type circuit breaker. Bulk Oil Circuit Breaker – The bulk oil circuit breaker uses transformer oil as an arc extinction medium of the circuit breaker. The oil also acts as an insulator between the two conducting parts of the circuit breaker. The rating range of oil circuit breaker lies from 25MVA at 2.5KV to 5000 MVA at 230KV. 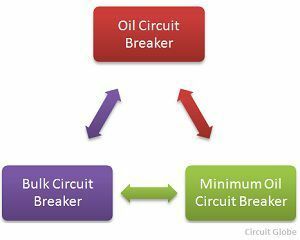 Minimum Oil Circuit Breaker – In the minimum oil circuit breaker, the oil is used for arc extinction by blast action. The main function of the oil in the minimum oil circuit breaker is to interrupt the arc formation, and it is not used for insulating the live parts of the earth. The four main types of oil circuit breaker are the air circuit breaker, air blast circuit breaker, Sulphur hexafluoride circuit breaker and the vacuum circuit breaker. Air Circuit Breaker – In air circuit breaker the arc is initiated and extinct in the static air in which the arc moves. 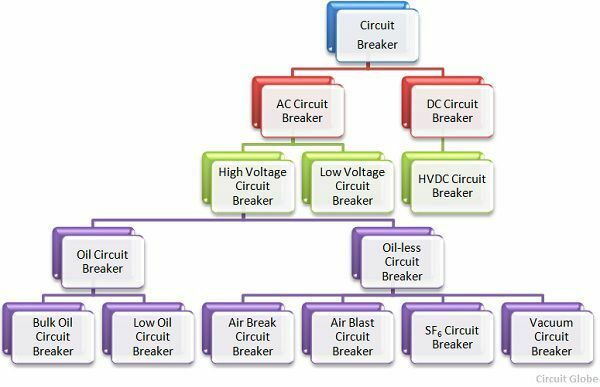 Such types of breaker are used in the range of low voltage up to 15KV, and the rupturing capacity of the breaker is 500 MVA.The classification of the air break circuit breaker depends on the types of air breaking methods. 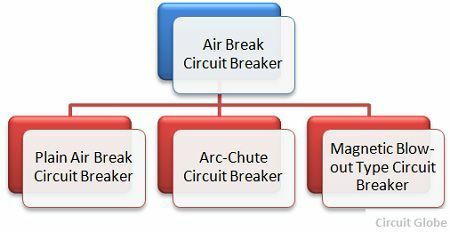 The types of the air break circuit breaker are shown below. In the plain air break circuit breaker, the contacts are made in the shapes of the horns. The magnetic blow type breaker uses magnetic field as an arc interruption medium and in the arc-chute circuit breaker low and medium voltage circuit are used for arc interruption. Air Blast Circuit Breaker – The air blast circuit breaker uses a blast of air to blow out the arc. In an air blast circuit breaker, compressed air is stored in the form of the tank and release through the nozzles to produce a high-velocity jet, which is used to extinguish the arc. Such type of circuit breaker is used for indoor services which have a medium high voltage field. The air blast circuit breaker is used for the low voltage up to of 15 kV and rupturing capacities of 2500 MVA. Such types of breakers are also used in outdoor switchyards for 220 kV lines. The types of the air blast circuit breaker are shown below. 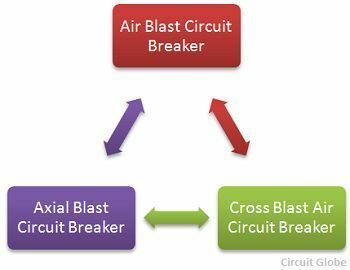 In axial blast circuit breaker, the air flows longitudinally in the direction of the arc while in the cross blast circuit breaker the air flows at the right angle of the arc. Sulfur Hexa Flouride Circuit Breaker – The sulphur hexafluoride circuit breaker uses SF6 gas for extinguishing the arc. The SF6 gas has great arc extinguishing property, and it is also superior as compared to other arc quenching media such as the oil or air. Vacuum Circuit Breaker – In such type of circuit breaker the contacts of the circuit are placed in the permanently sealed vacuum interrupter. The arc is quenched when the contacts are separated in the high vacuum. Such type of circuit breaker is less bulky, cheaper in cost, negligible maintenance and have a long life. The breaker which is used for the interruption of the high voltage direct current is known as the HVDC circuit breaker. The voltage breaking capacity of the HVDC circuit breaker is nearly 33KV, and for the current, it is 2KA. The main problem of the HVDC circuit breaker is that the DC is unidirectional and hence there is no zero point in the DC system. The fault current in the HVDC circuit breaker should be reduced to zero by using some external methods. The arc quenching medium of the air break circuit breaker is either oil or air blast.